An estimated 2,200 children and family members packed the youth center gym to enjoy this festive Easter event. Unlike the traditional egg hunt, children followed a path along colorful stations decorated in the four seasons theme. Each stop along the way featured costumed characters, who handed out candy-filled eggs and paused for photos. The event was organized according to age. 1 year olds – 10-10:30 a.m.
2-3 year olds – 10:30-11 a.m.
4-5 year olds – 11-11:30 a.m.
6-8 year olds – 11:30 a.m.-12 p.m.
Royal Crest Dairy sampled their delicious beverages and handed out 1/2 gallons of milk or chocolate milk to eager takers. The Chick-fil-A cow, decked out in Easter attire, posed for photos at every opportunity. There was quite a bit of ham in that bovine. Thanks to the generosity of our sponsors–ONLY because of our sponsor’s support–this event was FREE! Pick an Easter egg with an exclusive discount coupon offer. This was a unique egg hunt – in the pool! It was a safe environment for kids of all ages. The Splash for Eggs was divided according to age. Children under 3 years of age and pre-schoolers ages 3-5 hunted for eggs in the Kiddy Pool. Children ages 6-8, 9-11 and 12 and older splashed for eggs in the main pool. 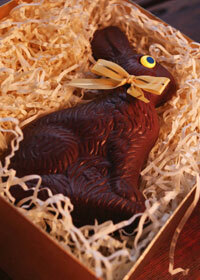 The first 50 kids who bowled got a FREE chocolate bunny. Seatings: 10 a.m., 11 a.m., 12:30 p.m., 1:30 p.m.
Click here to see the festive holiday menu. Cost: $24.95, $19.95 for Club members, children 5 and younger ate for free, children ages 8-12 were $6.95.